Beginning in February and throughout March, up until Easter, a horrific festival known as “Farra Do Boi” which translates to “Festival of the Oxen” takes place in Brazil. Several communities in Santa Catarina perform a disgusting ritual that ends in the death and torture of dozens of helpless bovine. A few days before the festival, the bull is confined and deprived of food. Often the food is kept right out of its reach with intentions to provoke a kind of crazed behavior. Then, the bull is finally released into a crowd of celebrants. 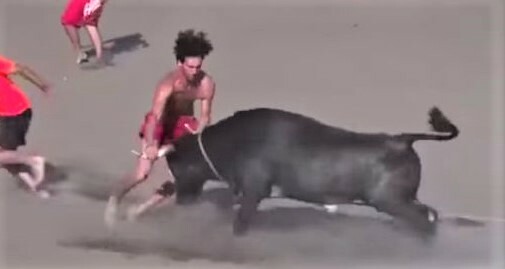 Villagers set upon the helpless animal while kicking, beating, and torturing it. The torture can last for up to three days and only ends when the bull has been thoroughly exhausted and is finally put out of its misery. In some cases, in order to dispatch the poor animal, festival goers hack off its limbs or set it aflame. No such “festival” should ever be allowed by the Brazilian government to take place. This is horrific, sickening and evil behavior that must end. While Brazil has animal cruelty laws and the festival has technically been banned since the late 90’s, Santa Catarina state officials have refused to crack down on the inhumane and illegal event. Time is running out to stop this festival before it starts this year in communities all across Santa Catarina. We must ACT fast and tell the governor of Brazil that this festival must END! Please sign this Care2 petition and tell Governor Carlos Moisés to crack down on this disgusting spectacle and punish those who, against the law, continue to celebrate it. SIGN HERE!